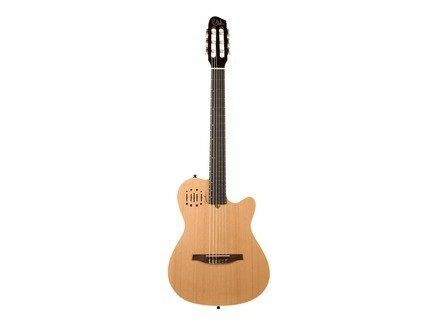 Encore Nylon, Other acoustic-electric guitar from Godin in the Multiac Nylon series. Made in Canada and introduced at this past Winter NAMM show, the Godin Multiac Encore Nylon is an instrument that offers players the features found in the Multiac electro-acoustic line-up. 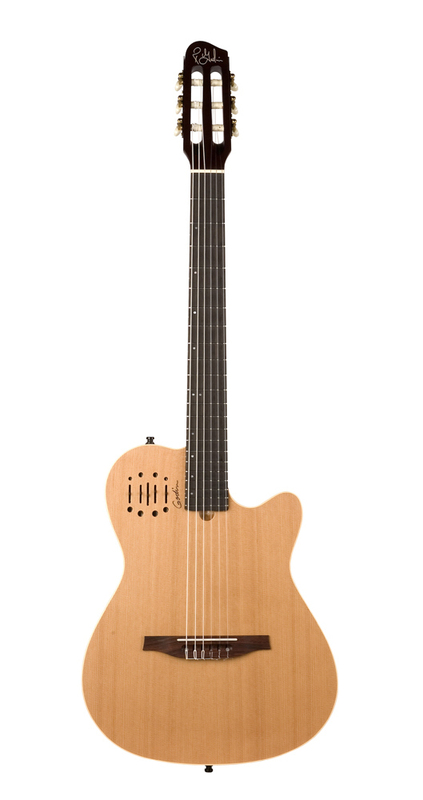 The Multiac Encore Nylon is equipped with Godin custom electronics. This Blendable Dual Source System features an undersaddle transducer as well as two acoustic soundboard sensors, with the ability to blend one into the other. These soundboard sensors are designed to add depth, warmth and can magnify the percussive nature of flamenco players. The Multiac Encore also features a 25 ½” scale and a 1 7/8” nut width, designed to let electric steel string players to transition to nylon strings. This model features a chambered silver leaf maple body with a solid cedar top, semi-gloss finish, as well as a dual source preamp with volume, treble, mid, bass and blend control sliders. The mahogany neck features a rosewood fingerboard with Godin’s “Ergocut” shaping technique, which bevels the edges of the fingerboard inwards for a worn-in feel. Suggested list price of $995. Gibson Flying V 7-String Gibson launches a new Flying V 7-string model in Ebony High-Gloss finish, with EMG pickups. Perri Ink Solostar Perri Ink, the new guitar brand by Nick Perri, recently announced the release of its second model, the Solostar. Hottie Guitars 327 Carved Top Hottie Inc. announced it is introducing a new Carved Top version of their Hottie 327 electric guitar.